To kick off a new graduate fellowship program at the University of Wisconsin-Stevens Point, I created a Ning social networking site through which the first cohort of fellows could interact with one another and with me over the summer prior to their arrival. The paper below describes this project and includes a number of links that take you to more screenshots like those above. Click here to return to the technology showcase page. Conserve School, a 9-12 private boarding school focused on outdoor activities and environmental themes, has just developed a joint project with the University of Wisconsin - Stevens Point College of Natural Resources. UW graduate students will reside at Conserve School for two years and teach high school students while they work toward their Master of Science in Natural Resources with an emphasis in environmental education through Stevens Point. Once they have graduated from the program, the grad fellows are expected to pursue careers as directors of nature centers, as environmental education teachers, as interpretive naturalists or forest rangers, and as other professionals within the field of environmental education. Their Master's program studies will be integrated with the work they will be doing here at Conserve School, and we (the school administrators) will collaborate with the UW-Stevens Point staff members to develop and administer the program. I supervise all the personnel who work with students on campus, so although the UW professors will be the actual teachers, I will be supervising the Graduate Fellows in their roles as school employees. 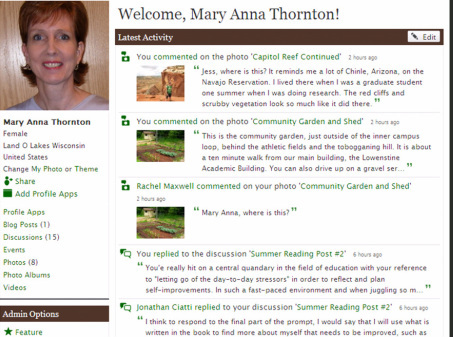 So this summer, as a prelude to the program, I will be communicating virtually, using a Ning social networking site, with the fourteen Graduate Fellows on a summer reading/reflection project. Each of them is assigned to read two books and make several online posts in response to prompts. They are all over the country at various summer jobs so this introductory experience could not exist if it were not virtual. University of Wisconsin personnel involved in this joint project were not familiar with the idea of using social networking as an educational tool and had not heard of a Ning before. The University of Wisconsin staff members have been highly supportive and helpful throughout the process of developing this joint program, and no one has been actively resistant to the idea of using a social networking site. The Coordinator of the Graduate Fellow Program has in fact been an enthusiastic adopter of the idea. Puzzlement, however, has been the more typical response. One staff member asked, genuinely startled by the idea, “Why would you want to do that?” To them, setting up and using a social networking site seemed like a lot of work with no clear gain. This paper, therefore, is imagined as a way to introduce these more skeptical staff members to what the Ning looks like – because they are so unfamiliar with social networking applications that it is difficult for them to envision it – and also to explain what it can accomplish for the Environmental Education Graduate Fellows. This paper will also demonstrate how the Graduate Fellow Ning conforms to recognized trends and standards in the current world of education. After being introduced to this information, the University of Wisconsin staff members should more readily be able to see the Ning as a serious element of the educational experience for the Grad Fellows rather than just an entertaining and trendy add-on. · To give the grad fellows a chance to get to know a few key staff members and one another prior to arriving at school in the fall, thus reducing their anxiety and increasing their ability to “jump right in” to the program. · To build excitement about the program. · To lay the groundwork for the goal-setting grad fellows will be doing in the fall. · To establish a common base of knowledge that students and staff can build on in the coming year. · Graduate students are all over the country pursuing various summer jobs. A group experience could not exist without a virtual platform. · Graduate students are from a generation that is highly familiar with social networking sites. The format will be intuitive for them. · The site is flexible enough that it can carry a variety of content: audio, video, text, photos, etc., and it can be set up to bring in information from the rest of the web via RSS feeds and links as well. 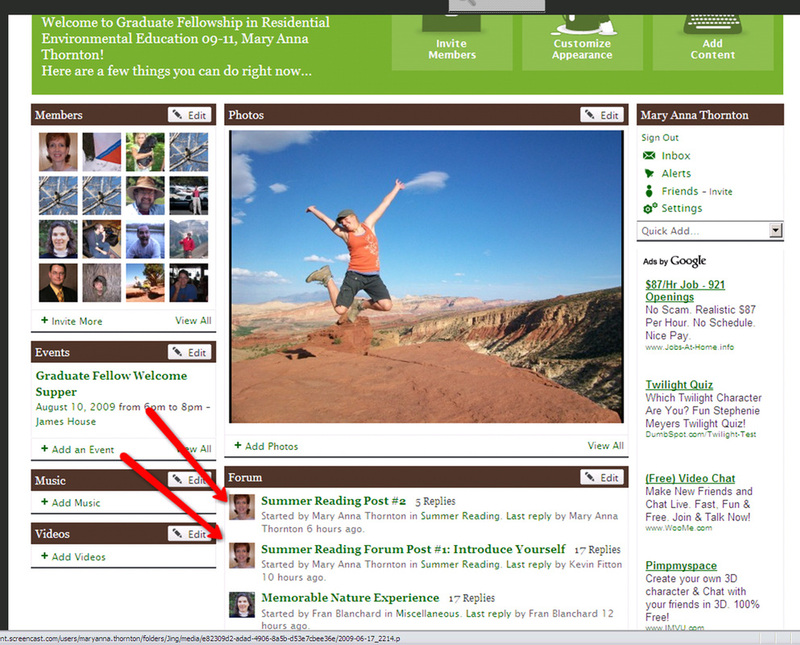 · All participants, both faculty and students, can easily log on and add content. The site is very user-friendly, with clear and simple instructions. Content is posted virtually instantaneously. · Control measures can be set from very restrictive (all content monitored and approved) to relaxed (no content monitoring) and these settings can be adjusted at any time. · A general explanation of the summer reading/reflection program. · A forum with a prompt for the grad students that asks them to introduce themselves to the group. · Four forums, with prompts, to be used in the future as the grad students work their way through the readings. · A blog that chronicles school events. · Photos of the school. · An embedded Delicious account with sites related specifically to the University of Wisconsin – Stevens Point graduate school and to environmental education in general. Grad students have started to add content to the Ning in the past few weeks. A few have begun to post their introductions and their reading reflections. Some of them have also begun to take ownership of the site by posting their own photos and modifying their home pages within our Ning site. The University of Wisconsin coordinator and I are responding quickly to continue to generate interest in the Ning and to guide the grad students in their reading and reflection. So far the Ning is going well with regular contributions from grad students. · The introductory post and the first reading response post on the home page of the Ning. You can see that the grad fellows have begun to add their own content to the Ning. This photo is from a slideshow posted by one of the grad fellows. · A photo of our Community Garden, part of a slideshow of the garden that I posted on the front page of the Ning. · The prompt for the introductory post that grad fellows make. · Grad students' replies to the introductory prompt. · The prompt for the second post, in which grad students begin to respond to the assigned readings. · All the reading/reflection prompts. · Grad students' responses to the first reading/reflection prompt. My response to the first student response is included. · The introduction to the reading/reflection program. This is within a sub-tab to the Forums page. · My own page within the Ning. You can see the conversations I'm involved in with grad students. · The second video introducing the school. Online learning is exploding in popularity. The North American Council on Online Learning (NACOL) states that it is “experiencing dramatic growth” and is necessary to prepare students for the workplace (Watson, 2007). The UW-Stevens Point Environmental Education Graduate Fellow Program itself relies heavily on on-line courses in order to allow graduate fellows to take up residencies at Conserve School and other associated locations while at the same time studying with University of Wisconsin professors. The recent bestseller in education, Disrupting Class, predicts that in a surprisingly short time education will be primarily virtual in nature (Chrstensen, 2008). Using social networking both in the classroom and as professional development is at the crest of this trend. Scores of K-12 schools and other educational institutions use social networking sites already. Steve Hargadon’s K-12 Educational Technology Blog claims there are over 9,000 currently in use in the world of education (Hargadon, 2008). See the Social Networks in Education Wiki for a list (Home, 2009). Using the Ning social networking site as an educational tool with graduate students will not only benefit them immediately, it will prepare them for their careers as educators by furthering their understanding of an educational format likely to be used widely in the future. 1) It is relevant in that it includes information that is interesting and useful from their perspective, including personal information about the other students in the program, schedules of events, and frequent updates. The Ning should appeal to individuals with different learning preferences because it includes a variety of means of sharing and taking in information, from videos, to forums, to photos, to RSS feeds. Graduate students can therefore choose to access and to add content using a variety of modes of communication. 2) The Ning includes synchronous on-line chat as well as asynchronous email and forums. 3) Both the graduate school program coordinator and I have formal instruction in teaching on-line courses. 4) The RSS feed brings information in from various sources on the web. Links within the Ning content also send readers to resources throughout the web. 5) I've included in the Ning the requirement that the graduate students create and send to me their reading and posting schedule. I have been following up individually with students who seem to be lagging behind, and I will continue to do so. I also have been following up with students who do not fully answer the prompts, asking them to elaborate on their responses. (1) I am creating a presence by posting photographs of myself and things that are important to me and by sharing personal as well as professional information about myself. (In some of my posts, I've described my former jobs, my family, what I like to do in my free time, etc.) In addition, I am responding quickly to the students' posts, taking care in each of my responses to provide a personalized response that demonstrates that I've carefully read and thought about what each student has expressed. (2) The Ning is free, easy to use, and easy to access. So far no one has reported any difficulties with it. The grad students had already demonstrated that they had access to technology and were comfortable with the basics by sending e-mails and filling out a detailed online application. (3) Without an online learning opportunity, the grad students would not have had the chance to start to get to know one another and to have a meaningful reading and reflection experience over the summer. I could have assigned readings, but without the extra structure, interactivity, and motivation provided by the Ning forums and additional enhancements, many grad students would probably not have finished the books and none of them would have gotten as much out of them. I could also have sent introductory letters to help the grad students get to know the program and one another over the summer, but without the technology, there would be no way for me to create the welcoming, interactive, and highly informational context created via the Ning. For many people, the concept of a social networking site may call to mind the image of students whiling away time surfing photos of friends on Facebook. Social networking sites offer a much wider range of formats than this image would suggest, however, and light social networking sites like Facebook are only one small – although very popular -- element of the larger group of social networking sites available on the web. Many of these sites are used for more serious purposes, and educational institutions in the past few years have begun to use social networking widely both in student courses and in teacher professional development. Social networks are just one of many new web tools that are easy to use and highly accessible methods of online learning and teaching. For the Conserve School/University of Wisconsin Graduate Fellows, a virtual educational experience is the only option during the summer, when they are scattered in a variety of locations. Utilizing a Ning social network for summer communication furthers the Graduate Fellow Program by allowing the grad students to begin an in-depth orientation to the program before they even step on campus. Furthermore, since demand for online coursework is increasing rapidly, using the Ning social network is an excellent opportunity for the grad students to develop skills in online teaching and learning that will be critical for them as they move into the teaching profession in the next two or three years. Chrstensen, C. (2008). Disrupting Class: How Disruptive Innovation Will Change the Way the World Learns. New York: McGraw-Hill. Dickson, R. (2009). Week 3B Mini-Lecture: More About Our Three Die Roten Faden. CEP820: Teaching K12 Students Online . Michigan State University Educational Technology Program. Education, M. S. Michigan Merit Curriculum Guidelines: Online Experience. Michigan Department of Education. Watson, J. (2007). A National Primer on K-12 Online Learning. North Americanl Council on Online Learning.